When you view your address book, you can click on each channel name, and see your contact details. Within a few days you will be able to download your Contacts along with your Inbox messages. The new YouTube messages is pretty basic. If you want to message a channel, you need to go to the channel's About tab and click "Send message". You will then be able to send a private message to that channel, and only that channel. You can view the messages you've sent or received on your Messages tab. You can get their by clicking your avatar in the upper right corner, then selecting Creator Studio -> Community. Note that if you delete a "Sent" message, the recipient's copy will be deleted as well. And if someone sends you a message and deletes it, or if they delete their entire Google+ profile, your copy of the message will disappear too. One thing you cannot do is send a YouTube Private Message to multiple recipients at the same time. 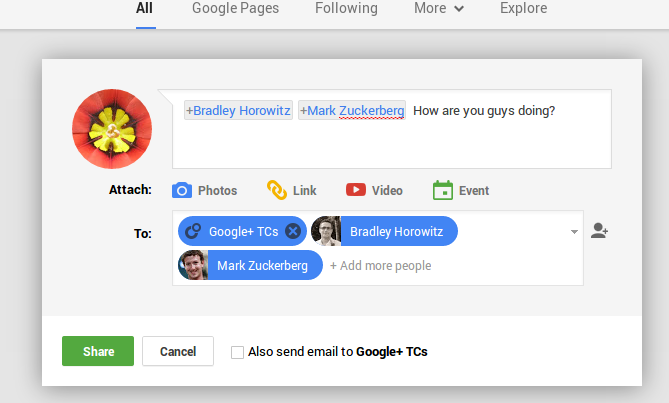 However, you can privately message multiple contacts using the Google+ commenting system. If you create a Google+ Circle from your current YouTube Contacts, you will be able to easily message all of your contacts at once. 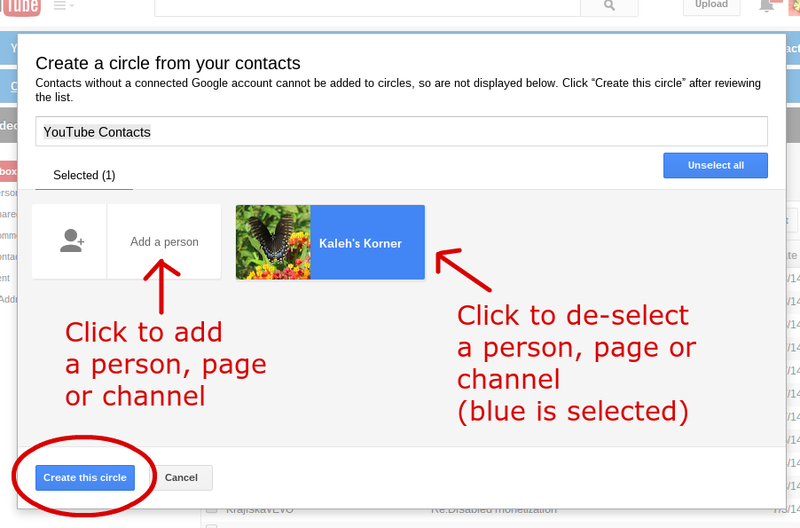 If your YouTube channel is connected to a Google+ Profile or Google+ Page, you will have the option to easily create a circle from your YouTube Contacts. Create a Google+ circle with your favorite YouTube contacts. Important: The people in your circles are publicly visible on your profile. 4. Click "Create" and a window will pop up that will allow you to create a new circle from your Contacts. Note: only YouTube channels that are connected to a Google+ Profile or Page will be included in the circle. 5. Add or remove contacts: Any contact highlighted blue will be included in your circle. You can de-select a contact by clicking on it. You can add to your Circle by clicking "Add a person" and typing the name of the person, channel, or email address of the contact. 6. 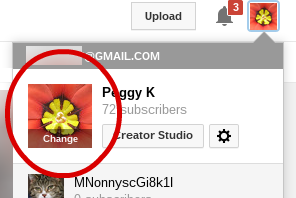 When you are done adding and removing contacts, click "Create this circle"
You can view your channel's Google+ Circles by clicking your avatar in the upper right corner, then once the menu appears, click your avatar a second time, which will bring you to the Google+ Page or Google+ Profile connected to your channel. Once you are on Google+, click "People" in the left menu, then (if you need to) "Your Circles" at the top of the screen. Now you have a circle of your YouTube contacts - how do you message them privately? You can send a private message directly either via YouTube or Google+. Sending a private message to a group on YouTube requires a bit of a work-around: because the new private message system only allows to message one channel at a time, you will instead need to make a comment on a channel or video that is only shared with a small group of individuals or one of your circles. 1. Go to a channel's "Discussion" tab or to a video watch page. 2. Click the comment box and write your message. 3. Click the word "Public"
5. Optional: de-select the option to "Also share on Google+" if you don't want your post to also appear on Google+. Only the circles or individuals you have shared your post with will be able to see it. 1. Go to the Google+ Profile or Page connected to your channel. You can do that from YouTube by clicking your avatar in the upper right corner, then, when the menu appears, clicking your avatar a second time. 3. Click the sharing box and type your post. + mention any individuals you want to be sure are notified of your post. 4. Remove the "Public" sharing option at the bottom of the post. Your post will be visible on your "Posts" tab and in the stream of the people you have shared your post with. No one else will be able to see it. Your latest change on YouTube has effectively isolated me. Now I cannot communicate with anyone unless I bend my knee to G+. Now, where's the delete account button? You could always put an email address on your About tab for people to communicate with you. I can't see the "send message" tab on my ABOUT in my youtube channel. How can I make that visible? Seems like people can't direct message me on my youtube channel. Please help! 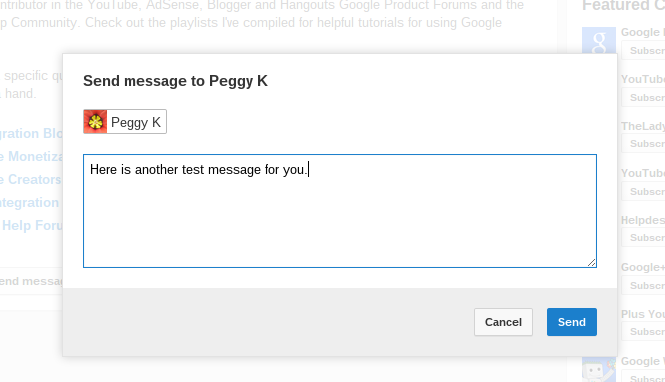 Hi Daisy Belle: you won't see the "Send Message" button on your own channel when you are signed in to YouTube. If you sign out of YouTube (or use an Incognito window) you should see the Send Message button on your channel's About tab. I am having the same problem. How do I get this fixed? flawlezzlala and teddybearheart2: you cannot see the option to send a message on your own channel. However, I checked and you do need to be signed into a channel to see the Send Message option - just a different channel than your own. Also, your channel must be connected to Google+ for that option to be visible. How can I delete a message I have sent though? You cannot delete a Youtube private message once you have sent it. You can think of it like an email, where once it's sent you cannot un-send it. after Ive shared a private post with a certain number of people how do I add more people into it so that they can also see the post and comment on it? Hi Scoyett: in a private conversation on Google+ you can + mention more people to add them to the conversation. So if I have shared a private post, I could add you by typing +scoyett (and seeing your profile come up). 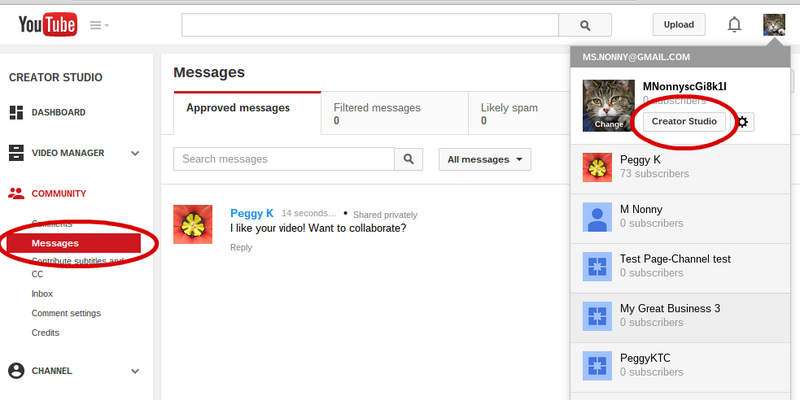 Peggy, I did all this, created a Youtube Contacts circle while in YouTube managing my Google+ Page. But now, I can't find that circle! Where is it? Do I see it in Youtube, or in my main Google+ profile? So confused, really hate Google now. Can I clean up my sent messages folder (deleting messages)?? I sent a private message to a use but it did not appear anywhere in my inbox or messages page under the community tab. Where do I find settings to get notified for receiving Youtube messages?? Google says: "If you’d like to receive an email notification when somebody sends you a message you can set this preference in your Google+ settings." 1. Sign in to YouTube, and make sure you are using YouTube with the correct channel identity. If you aren't, you can switch by clicking your channel icon, or by going to www.youtube.com/channel_switcher to change channels. 3. 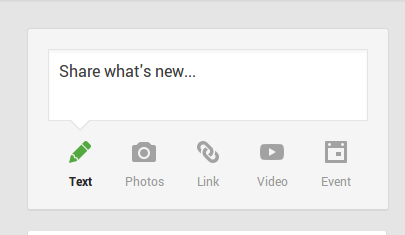 That should open the Google+ Profile or Google+ Page connected to your channel. Once Google+ opens, go to your Google+ settings by clicking "Settings" in the left menu. Thanks for that walkthrough! Hope it works :) Although it also sounds "dangerous", as in now everything that happens anywhere near the G+ account will probably give me a notification. But we shall see! HOW DO I FIND THE PRIVATE COMMENTS SECTION IN GOOGLE PLUS AND HOW DO I DELETE THOSE PRIVATE COMMENTS I RECEIVED THAT I DON'T WANT? SO FAR ALL THE INFORMATION I FOUND ON THIS HAS BEEN UTTERLY USELESS. IS THERE A WAY TO DO THIS OR NOT? - private messages on YouTube, both sent and received, are at www.youtube.com/messages . There is no way to delete those sent or received messages there, but received messages can be flagged as spam or abuse. If someone replies to one of your private messages, you can delete the original message by clicking the time stamp in the notification to open the message in a new window. That will have options if you click the little arrow in the upper right corner of the post. I can´t delete my sent messages. Every time I try to do that, red sign appears and says that there was an error with removing this message. I have no idea why I have this problem. I can´t delete my sent messages. Every time I try to do that, red sign appears, which says that there was an error with removing this message. I have no idea, why I have this problem. hi, is there any way to retrieve PMs from my old inbox? i didnt know anything about this change and now all the messages on my old channel are gone. Hi Claudia, no there isn't any way to retrieve your old Inbox messages. YouTube deleted them completely on December 1st. Rick: if someone sends a PM to your channel, i believe it might have been possible for them to mention your channel name. But since it was a private message to you that mention doesn't really make a difference - only you and the sender can see it. I don't think it is anything to worry about. Thank you very much for your quick response and for your assistance! I would like to receive a notification when somebody sends me a message (that is, a personal, private message) on YouTube. I don't see a way to turn on notifications for messages in the Google Plus Settings. Can this be done? How? However: I'm NOT getting an email notification. How do I turn that on? Any notification would be okay with me. I intend to check my messages every day, but I receive personal messages infrequently, so after weeks of no new messages, I forget, and get out of the habit (and then, when I remember, find that I've neglected a message for days or weeks). I want to be responsive, but I don't want to have to waste time constantly checking. Ah, will that do it? Thank you! It never occurred to me that "MY YouTube activity" would include OTHER people sending me messages. THERE NO TABS ON THE CHANNEL! NO ABOUT PAGE, NO DISCUSSION PAGE NOTHING! HOW DO I SEND A MESSAGE TO A CHANNEL WITH NO TABS?!? !